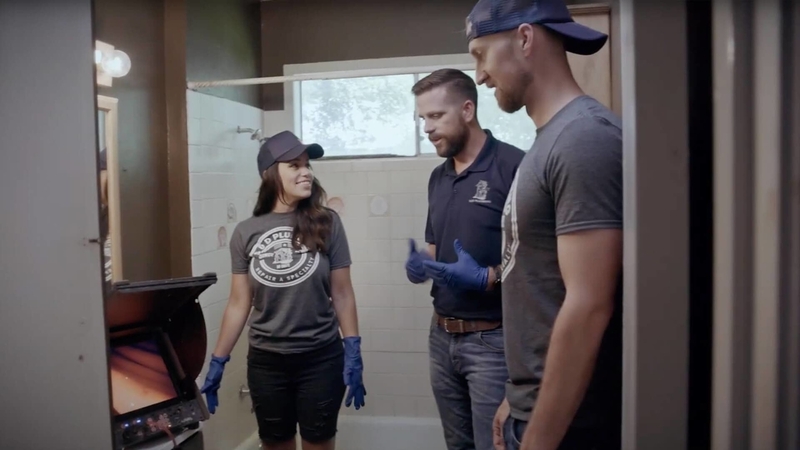 Join Bone and Jill as they put on their coveralls, drop into a 3-foot-wide, 40-foot-long crawlspace, and learn what it takes to be an investigative plumber with S & D Plumbing in Austin, Texas. "I think about the legacy my parents are going to leave and I think about the legacy I want to leave. I want people to say ‘Dan put so much service into helping me’….I mean, your legacy is touching the people around you that you can…and that’s really why I love working with the Scorpion family, because ya’ll have the same heart for service and you can see that." Michael “Bone” Sauer, nicknamed for his skinny frame as a teen, is Scorpion’s Chief Legal Officer by day. When he’s not working on being a legal machine, Bone is ALWAYS working on a new certification. He is currently working on his pilot’s license as well as many other certifications that will be beneficial in the event of a zombie apocalypse. Jill Wilson is Scorpion’s Director of PR. Around Scorpion, we consider her Wonder Woman. Jill was an investigative reporter, loves old-school journalism, is married and is the mom of a two year old son, Kal. There is never a dull moment around Jill.